Ivan Law book on Gear Making has a chapter on making Bevel gears using parallel depth cutters made with two buttons. O|n 26/5/2014 Neil Wyatt posted that Ivan Laws book had an error in the chapter on making Bevel Gears, but it did not affect 1 to 1 Bevel Gears but only Bevels which were not each 45 degree cones. He did not mention what the error was . I am now making a bevel and pinion which are on different size cones rather than 45 degrees and need to know what that error was if anybody know. which suggests that there isn't an error in the book. The pitch cone diameter calculations are incorrect in using SIN instead of COS. In the extreme of a flat faced crown gear, angle 90 degrees, the small end pitch diameter is zero (mutiply by COS 90), for a conventional gear small-end PCD = actual PCD, (multiply by COS 0). I think your argument applies to how the cutter is selected. I have previously posted here when I started looking into making bevel gears for my New Shay. I needed to make a gear of 40T and a pinion of 20T and had the spec. for a set of commercial gears of Mod 12. 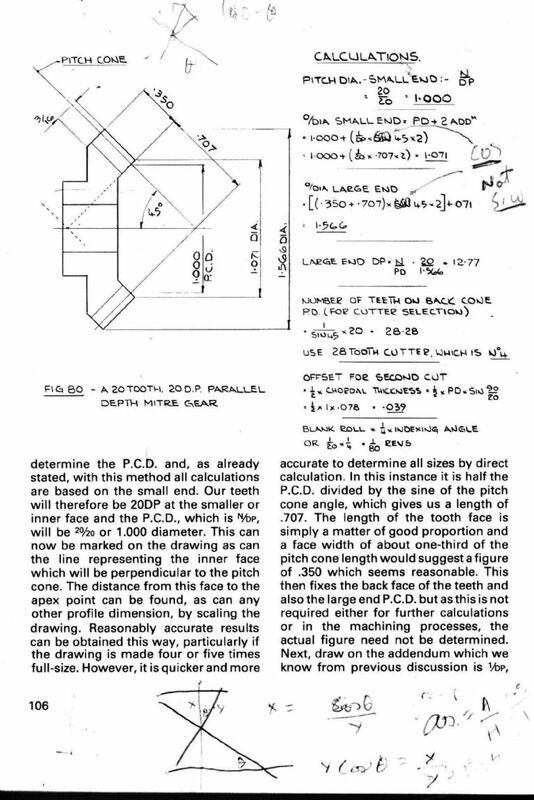 I am making the gears per Ivan Law book on Gears and had heard that there was an error in his directions relating to his use of 1/sin Cone Angle x num teeth in order to find the correct Cutter number and got responses here that the correct formula was 1/COS cone angle x num teeth. My gear has a cone angle of 63.43 degrees and the pinion is 26.57 degrees. I then drew a cone with a 63.43 deg angle and a 40 mm pd at the large end bottom and made the drawing 4x in size so it would be easier to work with. From the drawn cone, I was able to then work back up the cone to the small end and measured a pd of 29.80397040mm for the small end which works out to 29.80397041/40T = Mod .74509926 or .745 which works out to a DP of 34.08941782 or rounding off to 34.1 DP. I then calculated the estimated tooth number per the formula using COS rather than SIN and got 1/cos 63.43 x 40 =89.42727118 teeth which gives a button cutter of #2. From Laws Table for a 20deg pressure angle, diameter is then 32.15 x .745= 23.95175mm/25.4 = .943 inches. In figuring the 20 T pinion 1/cos 26.57 x 20 =22.36164558 or 22 teeth, a very small increase. Have I figured something wrong. Seems strange that I wind up with a cutter of 89 teeth for the gear more than double the size of the original number. Also, I did cut a set of cutters using a spread sheet I found either here or on another site using Laws book to make parallel bevels and after I finished making the cutters from the spread sheet, I realized that the spread sheet was also based on SIN rather than COS to determine the tooth number for the cutters, so I went back and started again, where I am now. Sorry to be so long but want to be exact as to what I was doing. the equivalent number for the 10 tooth pinion was 10.3, while for the 36 tooth gear it was 134. If you look at the tooth profile for the gear it is almost straight sided, like a rack. Andrew, Sure appreciate your reply. After posting, I found where I got the spread sheet from. It was posted here by Steve Witnell in Bevel Gears back in 2014. He clearly used SIN in his Spread sheet. He also said in the posting that he had made all the changes from Laws mistakes. Based on that, last night I started to go back and make blanks for a gear cutter with the original button cutters I made using COS. You have me convinced, but I sure have wasted a lot of time with this problem. Also, the cutter for the 89 tooth is about .940 inches and was going to order a piece of Drill Rod for it last night. I may just turn off a small piece from my 1.5 inch piece.